Stem-cell therapy medical practice which is used to treat or prevent a disease or condition using stem cells. Recent inventions and R&D activities have shown that stem cells have tremendous promise to help us understand and treat a range of diseases, injuries and other health-related conditions. Globally increasing R&D activities and growing interest of the major pharmaceutical players in stem cell therapy is expected to drive the demand during the period of study. Geographically North America dominated stem cell therapies market driven by best in class infrastructure, best in industry practices and higher spending by the citizens towards healthcare expenditure. North America was followed by Europe and Asia-Pacific as second and third largest market for stem cell therapies market. Asia Pacific is projected to have fastest growth, owing to rapidly developing medical infrastructure, increasing medical tourism, increased spending, and increasing awareness amongst population in developing nations such as China, and India in this region. This report identifies the global stem cell therapies market size in for the year 2014-2016, and forecast of the same for year 2021. 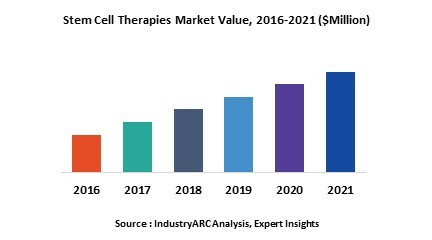 It also highlights the market drivers, restraints, growth indicators, challenges, and other key aspects with respect to global stem cell therapies market. 14.2. Advanced Cell Technologies, Inc.